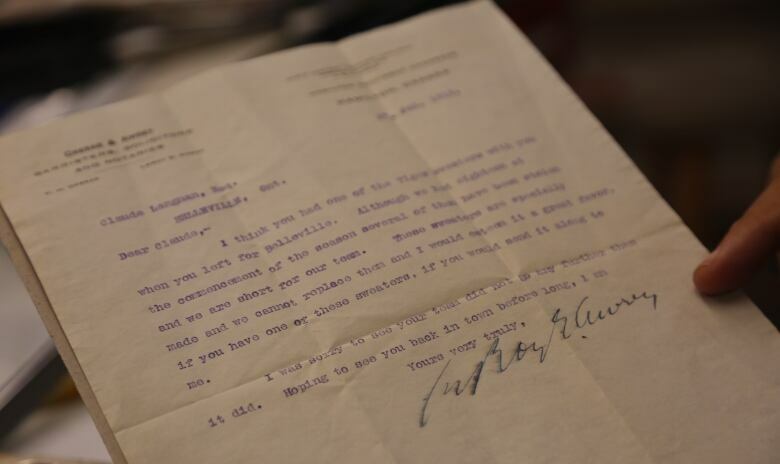 Collector Ed Agopian recently discovered a letter dated 1915 from a lawyer asking for a stolen football jersey to be returned. Now he's looking for answers. Ed Agopian knew the letter was special the second his fingertips brushed the brittle parchment paper it was printed on. But it was the opening two lines that made him laugh. "I think you had one of the Tiger sweaters with you when you left for Belleville," the letter reads. "Although we had eighteen at the commencement of the season several of them have been stolen and we are short for our team." The carefully worded phrases left no doubt in the longtime collector's mind — this letter about apparently pilfered football jerseys was written by a legal mind. "It's hilarious," said the owner of Hamilton's Imperial Coin and Stamp Co. "As soon as I read the first statement, I knew it was a lawyer's letter." The brief note from LeRoy E. Awrey to a man named Claude Langman, Esq. dated Jan 21, 1915, was discovered in a bin of about 50,000 envelopes that belonged to a stamp collector who had passed away. This is a buried treasure. I didn't expect it. 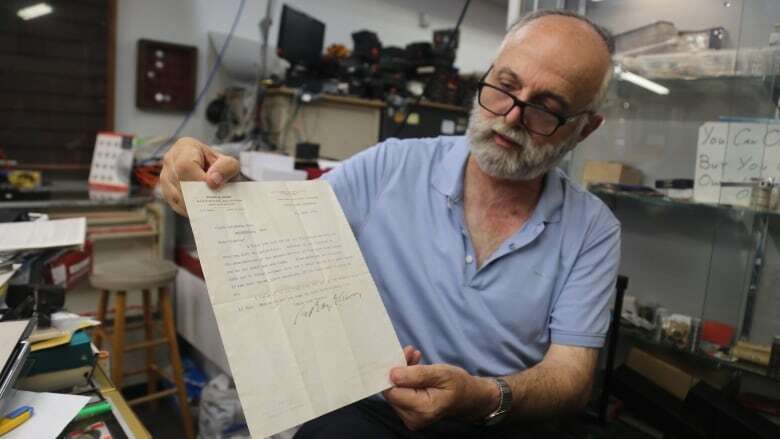 - Ed Agopian , owner of Imperial Coin and Stamp Co.
Agopian said bins stuffed with letters from local businesses between the early 1910s and 1950s were sold to him by the collector's family last year. But it was only by chance that this piece of Hamilton football history didn't end up in the garbage bin. The store owner said he was sorting through the reams of old stationery and about to toss it when his fingers touched the distinctive texture of parchment paper that was used by lawyers and businesses of the era. He decided to take a quick look at the five-line letter. He's glad he did. Agopian said the smeared ink signature appears authentic, as does the address and letterhead. Not to mention that the typeface seems to match the time period. "I knew it was the real McCoy," he said. "This is a buried treasure. I didn't expect it." Angelo Savelli, one of Canada's foremost collectors and a friend of Agopian, said he admires the discovery. While he prefers to collect game-worn pieces and trophies and even has a few bits of Tigers memorabilia himself, the idea of someone searching for stolen jerseys was a new one. "It's a pretty good find," he said. "I never heard of the football team losing their sweaters." The Hamilton Tigers are one of the foundations of the city's long football history and predate even its iconic Oskee Wee Wee chant. Not to be confused with the professional hockey squad of the same name that played from 1920-1925, the team's roots stretch back to 1869. That's when the Hamilton Football Club, otherwise known as the Tigers, played in the Ontario Rugby Football Union wearing the same colours, black and gold, that the team still dons to this day. Back in 1915, the year of the letter, they even won the Grey Cup, making those stolen jerseys even more desirable. "These sweaters are specially made and we cannot replace them and I would esteem it a great favour, if you have one of these sweaters, if you could send it along to me," Awrey writes. It wasn't until 1950 that the team merged with their hometown competition, the Wildcats, to form the Hamilton Tiger-Cats local fans still cheer for. As for Awrey, unlike the team, his legacy seems to have been cut short. 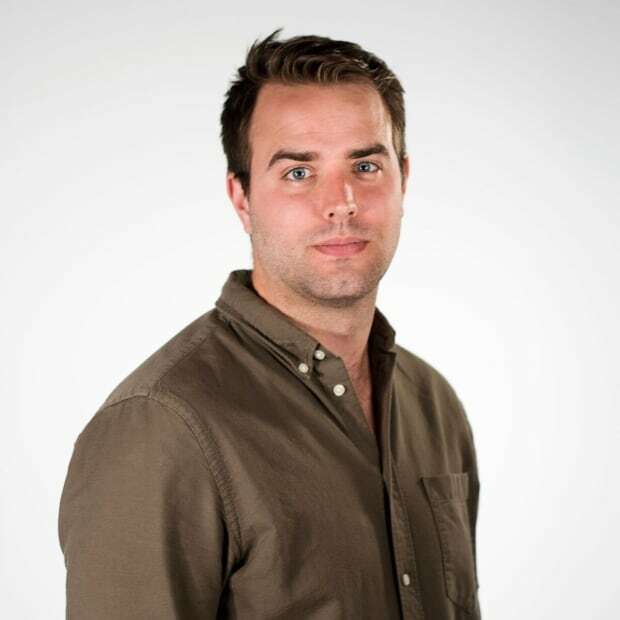 Mark DeNobile, executive director at the Canadian Football Hall of Fame and Museum ran a search of the names for both men on the letter. 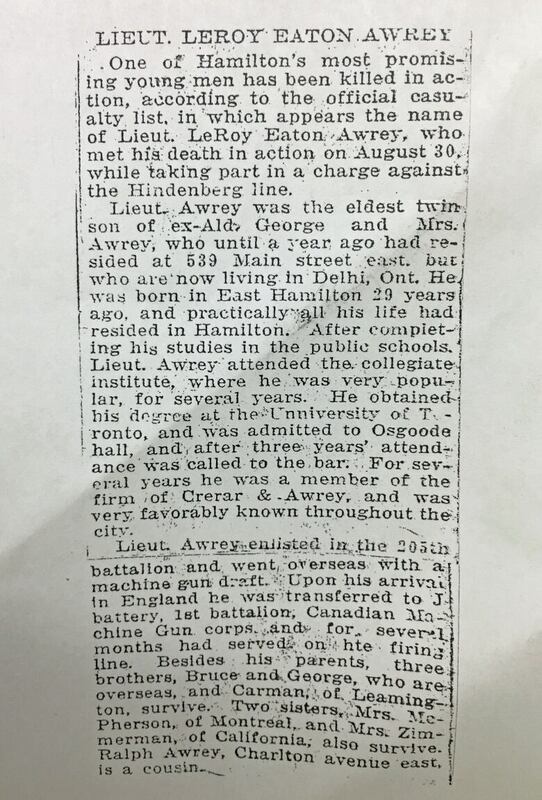 All that turned up in the files was an entry in the Canadian Great War Project for a Lt. LeRoy Awrey, a "Barrister and Solicitor" from Hamilton who enlisted in 1st Machine Gun Company in April 1916 and served in Europe before he was killed in action on August 30, 1918. Awrey was 29 when he died. A newspaper obituary from the same period that Agopian found in the Hamilton Public Library archives describes the ill-fated soldier as "one of Hamilton's most promising young men" and the "eldest twin son of ex-Ald George and Mrs. Awrey." The article says he was killed in a charge on the Hindenberg Line. 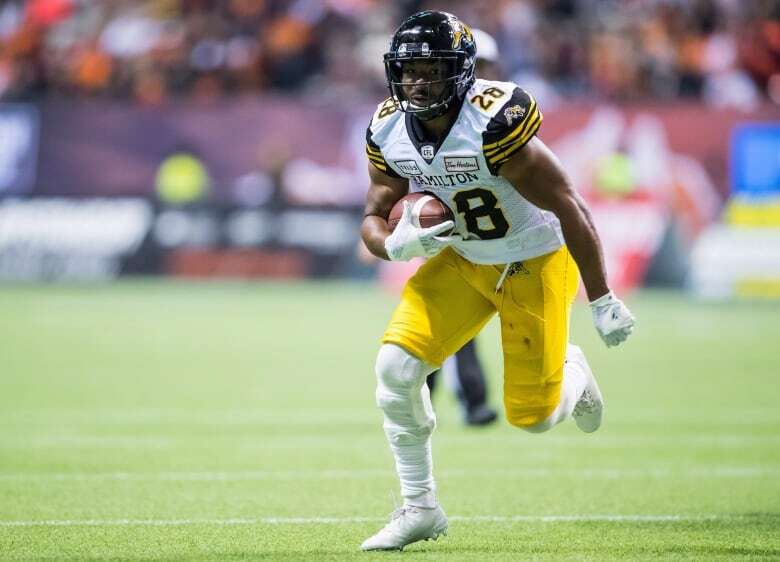 Agopian said he's a huge Tiger-Cats supporter and has plans to frame his find, although he is willing to entertain offers from anyone interested. But despite what he's learned about Awrey, the letter has left the collector with more questions than answers. "What happened to the jerseys after the letter? And who was stealing all the jerseys?"